Heavy-duty staple gun features an easy-squeeze handle and anti-jam mechanism that makes stapling quick and easy. Durable aircraft-aluminum housing withstands heavy use. High-visibility colour is easy to spot in toolbox or workshop. 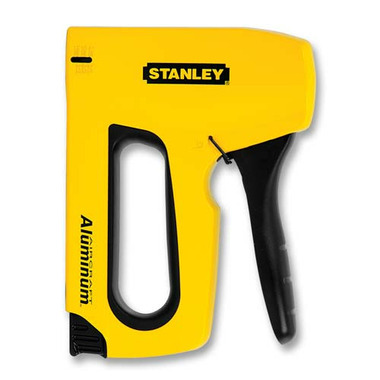 Staple gun offers an easy-slide, full-stick staple load. Uses Stanley TRA700 or Arrow T-50 heavy-duty narrow crown staples. This seems like a great tool but the compatible staples were not among your inventory...? Very inconvenient for me. I looked for the description that indicated which staples were needed but whatever they were- they weren't available in product list.